Should each conservative blog have at least three posts covering the now-infamous Clinton/Obama press conference? Why not! “Please go,” President Clinton said. And with that, Mr. Obama departed, leaving President Clinton to continue his extended conversation with the media. President Clinton went on for at least 20 minutes, moving at one point beyond the tax debate and offering his opinion on the administration’s new arms control treaty with Russia and the ongoing crisis in Haiti. Can you imagine the reaction in 2002 to a hypothetical Bush 43/Bush 41 press conference? Do you suppose Ronald Reagan was ever tempted to let Gerald Ford or Richard Nixon take his place? 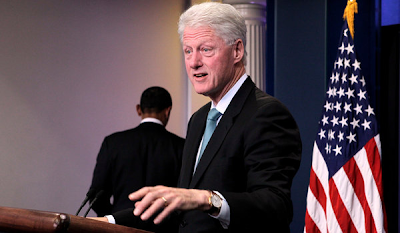 Who was that man standing next to President Clinton today at that presser? Wait, Is Clinton Still President? I just turned on CNN and Clinton's President. Is somebody gaslighting me? BREAKING: Incoming House GOP files articles of impeachment against Clinton again, "just in case." I'm sorry, what year it is? Bill Clinton told Obama he'd endorse the tax plan in exchange for "the occasional use of the Oval Office." Obama Names Bill Clinton to Presidential Post. Finally, America has a black President again. Clinton sends Obama out to get his coffee. Stunning image. Obama walks out of the room and leaves Clinton to act as President. Obama is so small now. Say what you want about Sarah Palin quitting her job, but at least she finished her own press conference. Is Pres. Clinton auditioning for White House press secretary?! Can someone please ask about Vince Foster? David Corn: Love how conservatives are saying this illustrates Obama's decline. You could say it shows his self-confidence. Joshua Treviño's retort: In the same way wearing a dress shows a confident manhood. Barring any earth-shattering surprises between now and December 31, this video should easily rank as one of the top three political clips of 2010. I would put: Obama turns back the clock in American Politics by reinstalling slick willie. still laughing at the "man child"... Unbelievable! I can't wait for the YouTube parody. They won't need to dub much.